Mac OS X has been around so long that Nickelback had the number one single the year it launched. So after over 15 years, it’s time for a change. OS X is officially dead, and has been renamed macOS. 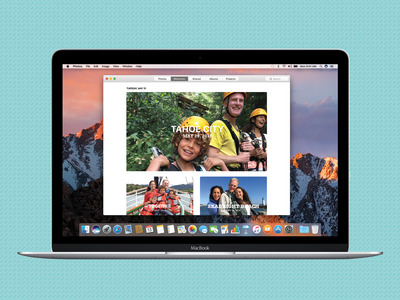 The first version of macOS, codenamed Sierra, launches this fall as a free update for most Macs. But there’s a public beta version out now, and I’ve been testing it for the last week or so. There are tons of changes in Sierra, and they all add up to a big, significant update for the Mac. So what can you expect? Time to dive in. Let’s start with Siri, since that’s the biggest and most significant new feature coming to Sierra. This isn’t the same Siri you’re used to. Yes, it can tell you a joke or give you weather and sports updates. But Siri on Mac has been retooled to perform a lot of desktop-specific tasks, like searching for files or adjusting settings that tend to be buried under layers of menus. Some examples: “Turn on Bluetooth.” “How much iCloud storage do I have left?” “Show me my music files.” “Show me documents I worked on yesterday.” And so on. My favourite feature so far is email search. I spend a lot of time digging through my inbox for the last email my editor sent me or a specific attachment. It’s so much easier to say, “show me emails from So-And-So” instead. It’s also nice to have image, Twitter, and web search baked right in, especially when you’re working in an app and need to look something up quickly. 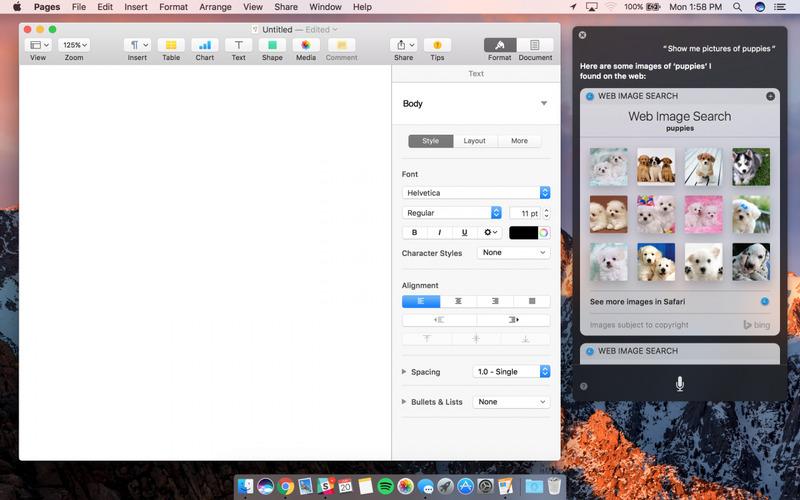 You can also drag content from the Siri window into the app you’re working on. All of these are thoughtful improvements. On the other hand, a lot of the features feel like they belong on the iPhone and were forced onto the Mac. It’s a bit awkward to dictate text messages and emails on your computer, especially when you have a big ol’ keyboard right in front of you. You’re better off ignoring that aspect of Siri. Maybe one day we’ll live in a future where it’s normal to talk to your computer instead of typing or clicking a mouse, but it feels out of place today. Then there’s Spotlight, which got a big update last year that lets you use natural language to search your Mac and check stuff like sports scores or weather. But a year later, Siri can do pretty much everything Spotlight can do and then some. It’s strange that Apple decided to leave Spotlight on the Mac instead of adding a text field to type into in Siri. You basically have two assistants for the same thing now, and they live right next to each other in your taskbar. I can see those two features merging together one day, but it’s odd that Apple would spend so much time improving Spotlight last year when it was about to add Siri to the Mac. Overall, it’s obvious that we’re in the early days of Siri on the Mac. While it’s wonderful for searching the web and files on your computer, it’s not going to radically change the way you use macOS. Photos is the next biggest update to macOS. Just like in the upcoming iOS 10, Apple built in a new artificial intelligence system that can scan the content of your photos and automatically group them into albums and slideshows. It’s also really useful for search — just look up “baby” or “dog” or “house” or a person’s name you’ve tagged and you’ll get exactly that. 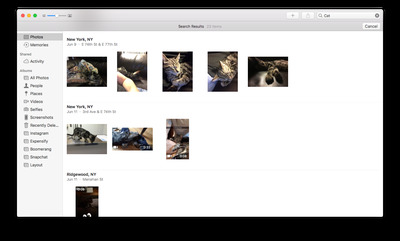 These improvements are very similar to Google Photos, which launched last year, except for one key difference. Instead of crunching all the data in the cloud like Google does, Apple Photos analyses everything locally on your Mac without sharing anything with Apple. In theory, this’ll keep your content much more private than it is with Google. I’ve been using Google Photos for a year now, so I’m not ready to make a call and say one service is better than the other. Since I have all my photos in Google, I’ve only taken a few dozen since I started testing Sierra last week. It will take a few more months before I can tell if it’s working as well as Apple says. So far though, Photos was able to automatically make an album of my trip to San Francisco for Apple’s WWDC event and show me photos of my adorable new cat Larry when I searched for “cat.” While Facebook and Google spend a lot of effort scanning your photos on their own servers, it’s really impressive Apple figured out how to do something similar while still keeping your photos private on your machine. 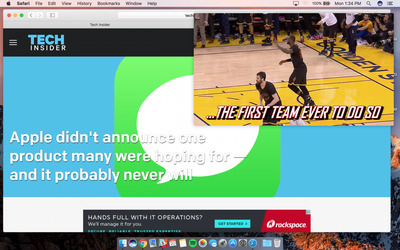 No other app got more attention at last week’s WWDC keynote than iMessage. It’s about to get a massive overhaul, essentially turning it into Apple’s own social network. 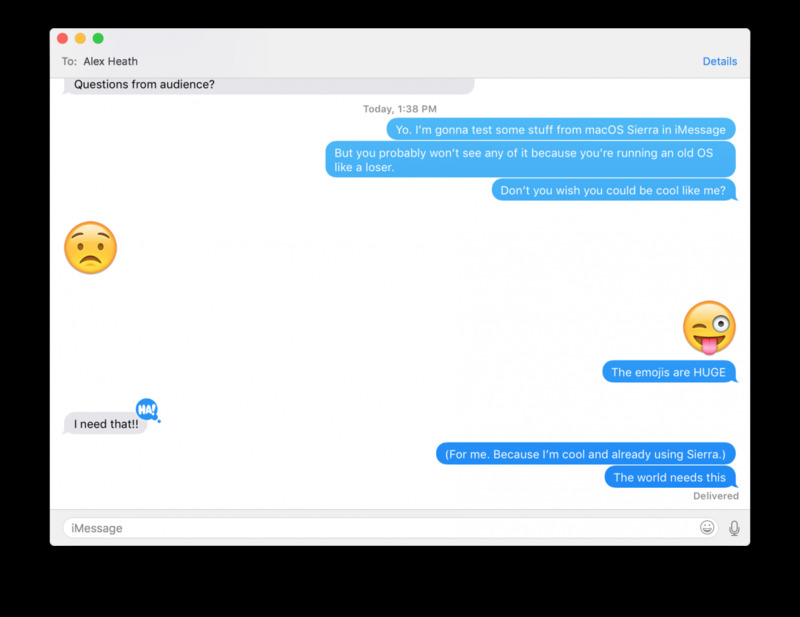 The Mac version of iMessage is also getting all those features too — from bigger emojis to rich information when you paste a link. It’s a huge, significant update to Apple’s most popular app. It worked well for me so far in Sierra, but it will be even better once iOS 10 is available and more people can start using it. I didn’t realise how much video I watch on my computer while doing other work. A lot of times I’ll keep a video playing while I listen to the audio and work in another browser tab, which is less than ideal. But in Sierra, you can pop videos out of the browser with picture-in-picture (PiP) video. There’s one major downside though. PiP only works with Safari, so you’re out of luck if you use Chrome, Firefox, or something else. There are loads of other relatively minor features coming to Sierra, and many of them won’t be ready until later versions of the beta or when the iOS 10 beta is available to the public next month. Here’s a list of what else to expect, and you can get even more details in my full tour of the Sierra beta. You can unlock your computer without a password if you’re wearing an Apple Watch. Apple Pay works in Safari if the retailer supports it. Sierra will automatically optimise your Mac’s storage by temporarily removing files you don’t need, like movies you’ve watched in iTunes. You can re-download those files from iCloud later when you need them. Apple Music has a new, bolder design, but (unfortunately) iTunes looks the same as always. Files on your desktop also save to your iCloud account and appear on all your devices. Other than Siri, there aren’t many major changes to the way macOS works. But add all those iterative improvements up, and Sierra feels like a hefty update. Even though you can get the beta now, I don’t recommend installing it on your primary Mac since there are still a few bugs Apple has to iron out before the fall. Most people should wait until then or test the beta on a Mac they don’t use very much.